Makui, A., Ghavamifar, A. (2016). Benders Decomposition Algorithm for Competitive Supply Chain Network Design under Risk of Disruption and Uncertainty. 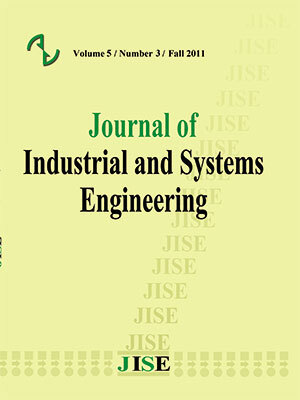 Journal of Industrial and Systems Engineering, 9(special issue on supply chain), 30-50. Ahmad Makui; Ali Ghavamifar. "Benders Decomposition Algorithm for Competitive Supply Chain Network Design under Risk of Disruption and Uncertainty". Journal of Industrial and Systems Engineering, 9, special issue on supply chain, 2016, 30-50. Makui, A., Ghavamifar, A. (2016). 'Benders Decomposition Algorithm for Competitive Supply Chain Network Design under Risk of Disruption and Uncertainty', Journal of Industrial and Systems Engineering, 9(special issue on supply chain), pp. 30-50. Makui, A., Ghavamifar, A. Benders Decomposition Algorithm for Competitive Supply Chain Network Design under Risk of Disruption and Uncertainty. Journal of Industrial and Systems Engineering, 2016; 9(special issue on supply chain): 30-50. In this paper, bi-level programming is proposed for designing a competitive supply chain network. A two-stage stochastic programming approach has been developed for a multi-product supply chain comprising a capacitated supplier, several distribution centers, retailers and some resellers in the market. The proposed model considers demand’s uncertainty and disruption in distribution centers and transportation links. Then, Stackelberg game is used to formulate the competition among the component of supply chain. A bi-level mixed integer programming is used for developing a supply chain performed currently, then the impacts of the strategic facility location on the operational decisions such as inventory and shipments, have been investigated. To solve the model, we have used Bender’s decomposition algorithm, which is an exact algorithm for solving mixed integer programming. Finally, the outputs of the model are illustrated for investigating the efficiency of proposed model. Then, some discussions have been done through several numerical examples and some managerial insight has been suggested for the situations similar to the assumed problem. Azad, N., Davoudpour, H., 2013. Designing a stochastic distribution network model under risk. The International Journal of Advanced Manufacturing Technology 64, 23-40. Ben-Ayed, O., Boyce, D.E., Blair, C.E., 1988. A general bilevel linear programming formulation of the network design problem. Transportation Research Part B: Methodological 22, 311-318. Benders, J.F., 1962. Partitioning procedures for solving mixed-variables programming problems. Numerische mathematik 4, 238-252. Bernstein, F., Federgruen, A., 2004. A general equilibrium model for industries with price and service competition. Operations research 52, 868-886. Bode, C., Wagner, S.M., 2015. Structural drivers of upstream supply chain complexity and the frequency of supply chain disruptions. Journal of Operations Management 36, 215-228. Boyaci, T., Gallego, G., 2004. Supply chain coordination in a market with customer service competition. Production and Operations Management 13, 3-22. Cardona-Valdés, Y., Álvarez, A., Ozdemir, D., 2011. A bi-objective supply chain design problem with uncertainty. Transportation Research Part C: Emerging Technologies 19, 821-832. Cardoso, S.R., Barbosa-Póvoa, A.P., Relvas, S., Novais, A.Q., 2015. Resilience metrics in the assessment of complex supply-chains performance operating under demand uncertainty. Omega 56, 53-73. Drezner, Z., 1987. Heuristic solution methods for two location problems with unreliable facilities. Journal of the Operational Research Society, 509-514. Fallah, H., Eskandari, H., Pishvaee, M.S., 2015. Competitive closed-loop supply chain network design under uncertainty. Journal of Manufacturing Systems. Farahani, R.Z., Rezapour, S., Drezner, T., Esfahani, A.M., Amiri-Aref, M., 2014a. Locating and capacity planning for retailers of a new supply chain to compete on the plane. Journal of the Operational Research Society. Farahani, R.Z., Rezapour, S., Drezner, T., Fallah, S., 2014b. Competitive supply chain network design: An overview of classifications, models, solution techniques and applications. Omega 45, 92-118. Giri, B.C., Bardhan, S., 2015. Coordinating a supply chain under uncertain demand and random yield in presence of supply disruption. International Journal of Production Research, 1-15. Gurnani, H., Erkoc, M., Luo, Y., 2007. Impact of product pricing and timing of investment decisions on supply chain co-opetition. European Journal of Operational Research 180, 228-248. Han, X., Chen, D., Chen, D., Long, H., 2015. Strategy of Production and Ordering in Closed-loop Supply Chain under Stochastic Yields and Stochastic Demands. International Journal of U-& E-Service, Science & Technology 8. Hsu, C.-I., Li, H.-C., 2011. Reliability evaluation and adjustment of supply chain network design with demand fluctuations. International Journal of Production Economics 132, 131-145. Jabbarzadeh, A., Fahimnia, B., Sheu, J.-B., 2015. An enhanced robustness approach for managing supply and demand uncertainties. International Journal of Production Economics. Jabbarzadeh, A., Jalali Naini, S.G., Davoudpour, H., Azad, N., 2012. Designing a supply chain network under the risk of disruptions. Mathematical Problems in Engineering 2012. Keyvanshokooh, E., Ryan, S.M., Kabir, E., 2015. Hybrid robust and stochastic optimization for closed-loop supply chain network design using accelerated Benders decomposition. European Journal of Operational Research. Ko, H.J., Evans, G.W., 2007. A genetic algorithm-based heuristic for the dynamic integrated forward/reverse logistics network for 3PLs. Computers & Operations Research 34, 346-366. Pan, F., Nagi, R., 2010. Robust supply chain design under uncertain demand in agile manufacturing. Computers & Operations Research 37, 668-683. Park, S., Lee, T.-E., Sung, C.S., 2010. A three-level supply chain network design model with risk-pooling and lead times. Transportation Research Part E: Logistics and Transportation Review 46, 563-581. Peng, P., Snyder, L.V., Lim, A., Liu, Z., 2011. Reliable logistics networks design with facility disruptions. Transportation Research Part B: Methodological 45, 1190-1211. Pishvaee, M., Razmi, J., Torabi, S., 2014. An accelerated Benders decomposition algorithm for sustainable supply chain network design under uncertainty: A case study of medical needle and syringe supply chain. Transportation Research Part E: Logistics and Transportation Review 67, 14-38. Rezaee, A., Dehghanian, F., Fahimnia, B., Beamon, B., 2015. Green supply chain network design with stochastic demand and carbon price. Annals of Operations Research, 1-23. Rezapour, S., Allen, J.K., Mistree, F., 2015. Uncertainty propagation in a supply chain or supply network. Transportation Research Part E: Logistics and Transportation Review 73, 185-206. Rezapour, S., Farahani, R.Z., 2010. Strategic design of competing centralized supply chain networks for markets with deterministic demands. Advances in Engineering Software 41, 810-822. Rezapour, S., Farahani, R.Z., 2014. Supply chain network design under oligopolistic price and service level competition with foresight. Computers & Industrial Engineering 72, 129-142. Romeijn, H.E., Shu, J., Teo, C.-P., 2007. Designing two-echelon supply networks. European Journal of Operational Research 178, 449-462. Sadghiani, N.S., Torabi, S., Sahebjamnia, N., 2015. Retail supply chain network design under operational and disruption risks. Transportation Research Part E: Logistics and Transportation Review 75, 95-114. Saharidis, G.K., Ierapetritou, M.G., 2009. Resolution method for mixed integer bi-level linear problems based on decomposition technique. Journal of Global Optimization 44, 29-51. Santoso, T., Ahmed, S., Goetschalckx, M., Shapiro, A., 2005. A stochastic programming approach for supply chain network design under uncertainty. European Journal of Operational Research 167, 96-115. Seifert, R.W., Langenberg, K.U., 2011. Managing business dynamics with adaptive supply chain portfolios. European Journal of Operational Research 215, 551-562. Shen, Z.-J.M., 2005. A multi-commodity supply chain design problem. IIE Transactions 37, 753-762. Shen, Z.-J.M., Daskin, M.S., 2005. Trade-offs between customer service and cost in integrated supply chain design. Manufacturing & service operations management 7, 188-207. Snyder, L.V., Daskin, M.S., 2005. Reliability models for facility location: the expected failure cost case. Transportation Science 39, 400-416. Sun, H., Gao, Z., Wu, J., 2008. A bi-level programming model and solution algorithm for the location of logistics distribution centers. Applied Mathematical Modelling 32, 610-616. Torabi, S., Baghersad, M., Mansouri, S., 2015. Resilient supplier selection and order allocation under operational and disruption risks. Transportation Research Part E: Logistics and Transportation Review 79, 22-48. Üster, H., Agrahari, H., 2011. A Benders decomposition approach for a distribution network design problem with consolidation and capacity considerations. Operations Research Letters 39, 138-143. Vidal, C.J., Goetschalckx, M., 2001. A global supply chain model with transfer pricing and transportation cost allocation. European Journal of Operational Research 129, 134-158. Viswanadham, N., Gaonkar, R.S., 2003. Partner selection and synchronized planning in dynamic manufacturing networks. Robotics and Automation, IEEE Transactions on 19, 117-130. Xiao, T., Yang, D., 2008. Price and service competition of supply chains with risk-averse retailers under demand uncertainty. International Journal of Production Economics 114, 187-200. Xu, J., Liu, Q., Wang, R., 2008. A class of multi-objective supply chain networks optimal model under random fuzzy environment and its application to the industry of Chinese liquor. Information Sciences 178, 2022-2043. Yin, S., Nishi, T., Grossmann, I.E., 2015. Optimal quantity discount coordination for supply chain optimization with one manufacturer and multiple suppliers under demand uncertainty. The International Journal of Advanced Manufacturing Technology 76, 1173-1184. You, F., Grossmann, I.E., 2008. Design of responsive supply chains under demand uncertainty. Computers & Chemical Engineering 32, 3090-3111. Yu, H., Zeng, A.Z., Zhao, L., 2009. Single or dual sourcing: decision-making in the presence of supply chain disruption risks. Omega 37, 788-800. Zhang, D., 2006. A network economic model for supply chain versus supply chain competition. Omega 34, 283-295. Zhang, L., Rushton, G., 2008. Optimizing the size and locations of facilities in competitive multi-site service systems. Computers & Operations Research 35, 327-338.